On April 10, 2019, a never-before-seen phenomenon was revealed thanks in part to the National Science Foundation (NSF), Event Horizon Telescope (EHT) researchers, and IPAM’s Director of Special Projects, Stan Osher. 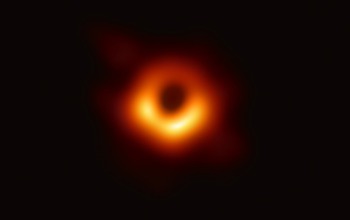 The first ever image of a black hole was an extraordinary feat accomplished by a team of over 200 researchers funded by NSF. Osher’s algorithm on Total Variation Denoising, created in 1992 with Leonid Rudin and Emad Fatemi, was a key factor in the success. Total Variation Restoration enables the clean reconstruction of noisy, blurry images – especially their piecewise constant regions. With the help of the total variation regularization algorithm, the EHT was able to “robustly and reasonably achieve super-resolution sufficient to clearly resolve the black hole shadow.” The EHT is a planet-scale array of eight ground-based radio telescopes forged through international collaboration and designed to capture images of a black hole. In addition to capturing the first image of a black hole, the Rudin-Osher-Fatemi model is used to identify waveforms from binary black hole events. Researchers and past IPAM participants Antonio Marquina, Alejandro Torres-Forné, and Jose Antonio Font have expanded the use of the model for gravitational waves denoising and waveform reconstruction, which was highlighted during IPAM’s winter 2019 workshop on Computational Challenges in Gravitational Wave Astronomy. IPAM is delighted in Osher’s contribution and is looking forward to what’s next in this exciting field!